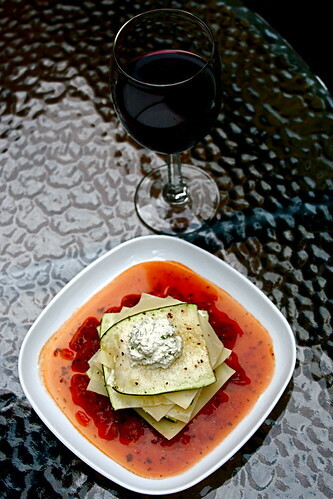 As we continue with the Summer of Zucchini here on the blog, we’ve moved to some rather familiar but still delicious territory: free-form lasagna. The dish is nothing new–bazillions of recipes are out there on the internet–but I gave it an easy vegan twist with basil cashew ricotta and slightly roasted zucchini slices. For this recipe, the mandoline is your friend. Requiring relatively few ingredients, I couldn’t have been happier with the result. The cashew ricotta actually tasted like ricotta (something I didn’t expect…I figured it be more like cashew butter so definitely a good surprise) and the basil made it nicely herbacious and summery. The sauce was canned last season and the zucchini only takes 10 minutes or so to roast. As for the pasta, another ten minutes and you’re good to go. It’s the perfect meal for al fresco dining and a glass of Chardonnay–light, satisfying, and full of the garden’s summer brightness. At least four hours before using (I started mine before I left for work in the morning), place the cashews in a bowl and cover with water to soak. Place in the fridge until you make the ricotta. Drain the cashews and place in a food processor. Process until a crumbly meal forms. Add 1 tsp lemon juice and 1 tbsp of water. Continue to process until smooth, adding more water as necessary. Add the salt and then more lemon juice to taste. After you’ve reached the texture you want, add the basil leaves and process to combine. Set aside. Place the pasta sauce in a sauce pot over low heat to warm. Bring another larger pot of salted water to a boil. Using a mandoline, slice the zucchini into thin slices. Place in a bowl and drizzle olive oil on top. Add a pinch of salt and black pepper. Toss to coat and then bake on a parchment lined baking sheet for 7-10 minutes until the zucchini begins to soften. Remove and set aside. Ladle half of the sauce into the bottom of the plate or bowl you’re serving the lasagna in. Layer a slice of zucchini, a noodle, and a dollop of ricotta spread evenly across the noodle. Repeat zucchini-noodle-ricotta until you’ve layered as much as you would like. Serve with a side salad and some crusty French bread. I don’t know if you’ve ever been to the Laughing Seed in Asheville, NC, but their raw manicotti uses zucchini and cashew ricotta. It remains one of the best dishes I’ve had at a restaurant, raw or not. I haven’t been to Laughing Seed yet, but that sounds great–definitely have to add them to my list. Yum! what a dainty and lovely little lasagna! 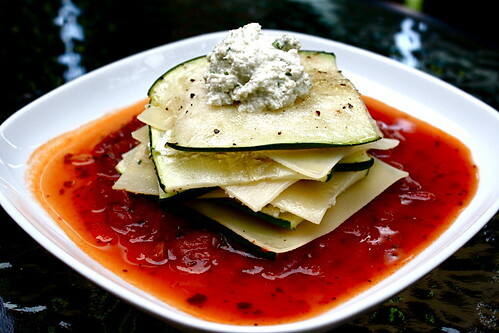 i love the mix of zucchini and pasta, with your amazing homemade sauce. Beautiful! You are making very creative and tempting use of all those zucchinis! Aha, this looks familiar! Great minds think alike, etc etc. Roasted zucchini sounds like a great idea! Ha! Did you just post this? (Or am I having a brain fart–which happens all too often…) Love that we seem to make the same things around the same time. I’m so doing this. Maybe with some aubergine in there? Like ratatouille in lasagna form. Oh, definitely–roasted eggplant would be rocking in the stack too. Maybe some roasted tomatoes too. Mmm. I’ve made all sorts of other lasanga but haven’t tried the free-form version yet. I’m going to have to hurry and get on it before the summer is over. It’s so yummy looking! Love me some cashew cheese! this is so clever, and elegant!